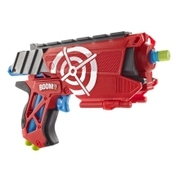 BOOMco.™ Farshot™ BlasterDart Toys & Blasters - Awesome Blasting Gear & Toys for Boys - BOOMco. The tip of every dart sticks like crazy to all Smart Stick targets and blaster shields. 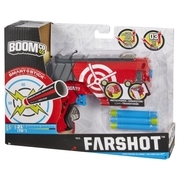 Farshot's single-fire blasting action allows for awesome accuracy, firing up to 70 feet! 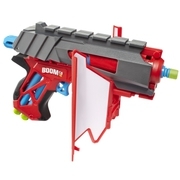 And it holds two additional darts in the handle for quick re-load. It also has removable transforming shields with Smart Stick technology, so you can capture your opponent's darts and use them yourself. The Farshot comes with 3 Smart Stick darts, removable transforming shields, and a Smart Stick target. 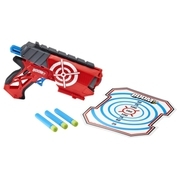 To create a more personalized blaster, pick up the Smart Stick Refills Printable Targets (sold separately) and create your own Smart Stick blaster shield and target designs!